Superbrawl is the most flexible football pool, office pool, and sports pool solution available. Whether you need to run a large mega pool for a website, or a small office pool for your friends, this is your pool solution. If you have custom rules for scoring, we can help you incorporate them. Nobody offers you the level of customization superbrawl does. We even let you custom build your own pool skin if you want! Your office pool can be run right here on this website, with dozens of options to configure your game, or you can embed the football pool on your website with creative control over your player experience. We offer many different methods to custom brand your football pool to your company products or services. Whether you use content management systems like wordpress to run your company website, or have a hosting account with any of the internet providers, we have the interface that will make your pool run from your website, and brand it to your theme. We can custom build your page for you and match your look and feel. Send us your website address, and we will clone it into a football pool solution. If you require your own .com domain, web hosting, and the football pool, we can provide all aspects of hosting your website. Including Hosting, FTP access, email addresses, and your football pool setup for you. NFL Football Software, Football Pool contests, and software for websites is our specialty here at superbrawl.com. If you have been running an office football pool for any length of time, you know how much work it can be to gather picks, score them, and distribute results. We will run your football pool online right here, on your own website, or we can set you up your own website complete with domain name and email like "yourpool.com". You can customize the look, feel, and graphics the way you want. The controls for your pool are overlaid right on top of your pool when you need them for easy management while you view your players, and page. We are continually adding features and abilities to the manager console, so you will probably see new buttons and forms there all the time. From here you control how your website interacts with ours, how many points a win is worth, survivor options, playoff options, the look and feel of your contest. 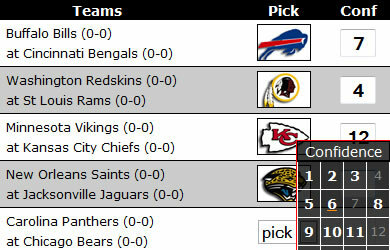 You can also input NFL picks for players who may have missed them. Website Hosting Solutions - we setup your own .com website and install the football pool for you. You can then use that website for anything you like, including business, family, or other sports interests. We can provide you with a template that you customize for your own website. Our program will update the scoring, handle picks, etc. You just enjoy the season. You can run your football pool from a link right here on our website. We're constantly creating new skins that you can use in your pools right here, but if you would like to have your own custom skin, let us know. We can help you create something that matches your brand perfectly. For CMS systems, there are controls present for embedding your football pool menu right into your CMS page. It's likely you may need help with the install, since all seem to be different, but we have experience with wordpress, godaddy, simple, hubspot, joomla, squarespace, and more.